Every potential business starts with a great idea — or at least what seems like one. 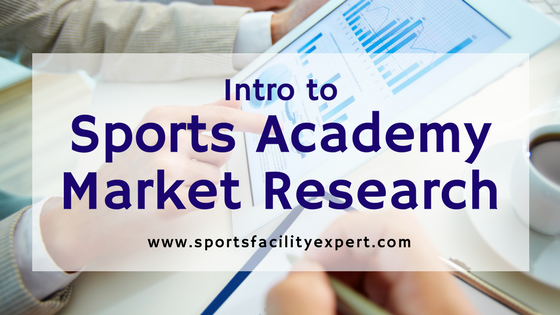 Getting market data for your sports academy is one way to test whether your idea will hold up. Detailed market research is essential if you’re seeking investors or plan to purchase a big piece of physical property. However, it’s also important if you’re starting small or operating on your own. This research could save you weeks and months of time and energy if it keeps you on the right business path. Plenty of market research companies will compile reports for you for a price. However, depending on your needs, you can start by taking some of the steps below to research your market. Start by listing groups of customers based on which services they would be interested in. After you’ve identified your segments, it’s time to get some numbers on the size and growth of each of these segments as it relates to your business. You can use U.S. Census data, knowledge about your community, and good old-fashioned internet sleuthing to get data from reputable industry groups and publications. Primary Market Segment: Kids in middle school and high school who want to improve in sports. There are more than 300 kids on high school sports teams and 400 on middle school sports teams (soccer, football, baseball, volleyball) at schools within a 20 minute drive of our facility. Within a 30 minute drive, there are an additional 100 high school athletes and 100 middle school athletes. You won’t be able to sell to everyone in the market segment — at least right away. To get a more realistic idea of how many will buy from you in the short-term, consider these factors. Your customers can only buy if they can reasonably afford your services. Use your demographic research to get an idea of how many people in the segment have the readiness and ability to buy right away. Example: The communities around our proposed location have a median household income of $75K, which is well over the threshold of the profile family who we expect to be interested in the memberships we’d like to offer. About half of the athletes’ families in our area will be able to easily afford our prices. Consider how difficult it will be to sell your idea considering competitors in the area. Put yourself in the shoes of your customer and consider which other alternatives they could use to obtain their goals. Read this post for more on assessing the competition. Example: Because there are few competitors within a 30 minute drive of our location, we don’t expect much competition for this market segment. Not every athlete will be interested in spending extra time and money to get to the next level, and your program simply won’t be a good fit for everyone. Gather some evidence to estimate how many will be highly interested in your services right away. Example: There are also 10 non-school club programs located within 30 minutes of our facility, including club soccer facilities, elite baseball programs, and volleyball clubs.This indicates that many families in this area are willing to invest in competitive programs that will give their kids an edge in sports. College-bound kids, more represented in the higher income levels, will be more interested in our services. What will make your services difficult to sell? Is the idea of sports performance training completely new to your community? Are you starting with connections with local coaches or do you still have to make them? Consider any other obstacles that might further limit your ability to sell in the short-term. Then, along with the factors listed above, you can make a guess about how many of the original market segment you can realistically expect to obtain. Example: Based on these factors and the fact that we primarily have inroads in the baseball community, we expect that we can reasonably obtain about 3-4% of this segment in the first year of opening. That works out to about 30 monthly members for sports performance training. To finish up your market research, you can add some notes on industry trends and relevant economic forecasts. Example: The sports performance industry continues to grow, evidenced by the emergence of speed school franchise locations that are adding new locations every few months nationwide in communities such as ours. Studies indicate that even during recessions, parents continue to prioritize activities that they believe will help their children’s future. Of course, your actual market research will include more specific examples and links to actual studies. For more on market research, check out this guide from the U.S. Small Business Association.